For Nikon F-Mount Lenses. Increase Focal Length by 1.4x. Maintains Metering and VR. Supports AF with Compatible AF-S Lenses. Front and Rear Fluorine Coatings. Weather-Resistant Barrel. The AF-S Teleconverter TC-14E III increases the reach of compatible AF-S lenses by 40% with only a 1-stop loss of light. Turn the AF-S NIKKOR 70?200mm f/2.8G ED VR into a 98?280mm f/4 lens or the AF-S NIKKOR 400mm f/2.8E FL ED VR into a 560mm f/4 lens. Enjoy the speed, performance and lightness of smaller telephoto lenses with the reach of a super-telephoto lens. 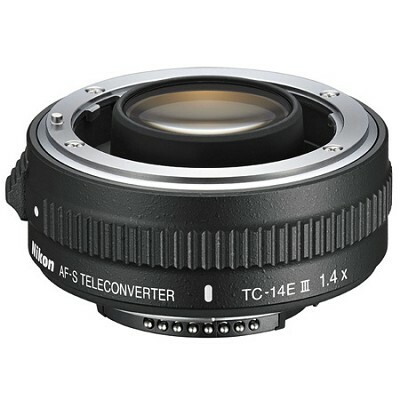 The AF-S Teleconverter TC-14E III features an optical design that draws peak performance from compatible AF-S NIKKOR lenses, including fast primes and zoom lenses. Enjoy stunning depiction - nearly the same image quality that a lens alone produces - outstanding autofocus accuracy, full metering performance and even VR image stabilization.